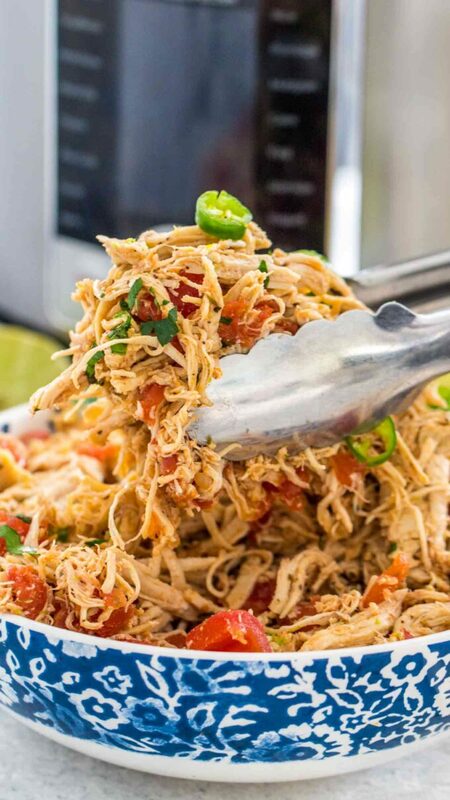 Instant Pot Salsa Chicken is a quick and easy recipe to make with just a few ingredients. With only 30 minutes of your time, you can have a perfectly healthy meal that can be used in tacos, burritos, over rice and salads. 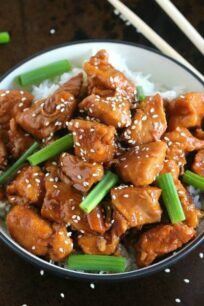 Similarly, this dish can be made with fresh or frozen breasts. 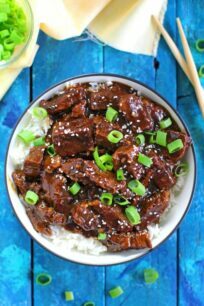 We love making easy and delicious recipes in the pressure cooker. The beauty of it is that you can have a perfect meal in a fraction of the time. Some of our popular recipes are Pressure Cooker Taco Soup and Loaded Baked Potato Soup. 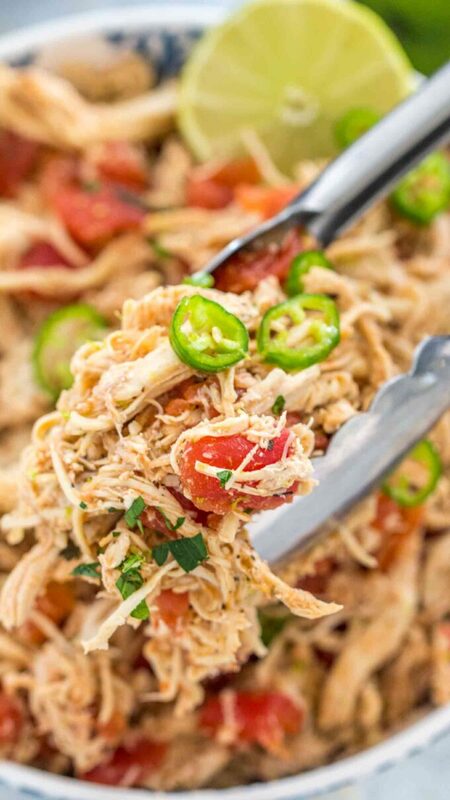 Instant Pot Salsa Chicken recipe is PERFECT for feeding a larger crowd, or hosting an event. 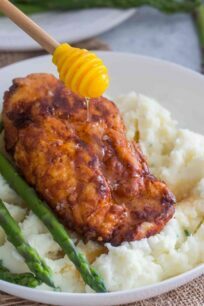 With this recipe, you can use the chicken in so many ways, like using it for enchiladas, tacos, roll-ups, salads, and many more. 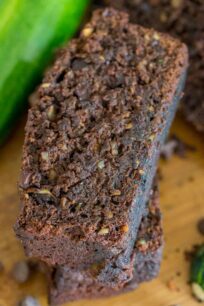 Therefore, making this dish is not only easy and healthy, but it can be used in literally dozens of meals. 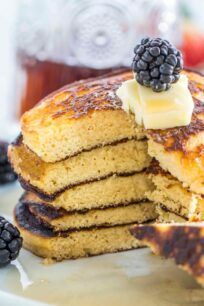 On top of that, the dish is a time saver and budget friendly. All you really need is chicken breasts and salsa. However, we try to add some seasoning into it to give the chicken a more profound flavor. Another benefit of making this meal, is that you can use frozen breasts. Not only will this save you time, but will result in a juicy and flavorful meal. 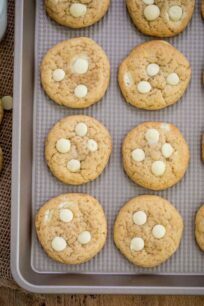 For detailed instructions and step by step guidelines, please click here. 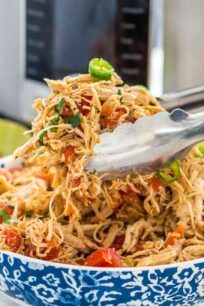 WHAT DO YOU NEED FOR INSTANT POT SALSA CHICKEN? Fresh or frozen chicken breasts. If using frozen breasts, make sure they are not stuck-frozen to each other. This is important, as it may not cook uniformly. 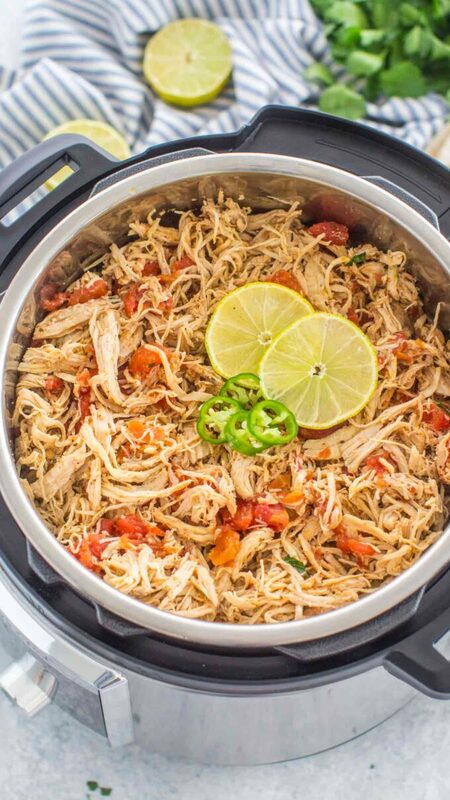 HOW TO MAKE Instant Pot Salsa Chicken? Place the chicken breasts in the inner pot of the pressure cooker. Next, add in 1 1/2 cups chicken broth, water or pineapple juice. 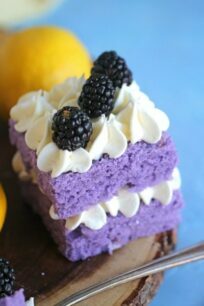 If you add pineapple juice, it will result in a sweeter dish. Add 1 cup of salsa, seasoning, and garlic powder to taste. Set pressure cooker to 10-12 minutes (depending of breast size) on high pressure, and turn the valve to seal in the steam. If the chicken breasts are smaller than average, set the cook time to 8-10 minutes. Let it rest briefly then shred before eating. This recipe is great because frozen chicken breasts work just as fine. For detailed instructions on how to use frozen breasts visit here. How do I know if CHICKEN BREASTS ARE COOKED? Best way to check is by using a food thermometer. A cooked chicken breast should have an internal temperature of about 165 degrees F before safe to consume. Therefore, once the cooking time is over in the pressure cooker, it is best to check the it’s internal temperature. If internal temperature is less than 160 degrees, place it back inside, and cover the lid. Cook for another 3-5 minutes on high pressure. How to make Instant Pot Salsa Chicken Tacos? Once the chicken is cooked in the pressure cooker use tongs to transfer the it into a bowl. Also, you can place the chicken breast onto a cutting board and cut it, or shred into pieces, based on preference. 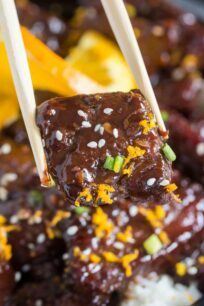 Once shredded, add some of the cooking liquid to it for a juicier flavor. The chicken will absorb the liquid, become tender and more flavorful. Lastly, put the meat on top of tortillas. Top with some avocado, cilantro, and cheese. WHAT DO YOU SERVE Salsa Chicken With? Use enough liquid. 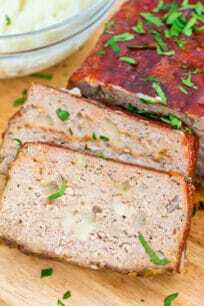 For moist and juicy meat, is important to use enough liquid when cooking. As described above, use at least 1 1/2 cups of liquid when cooking the breasts. For deeper flavor, we recommend using broth or pineapple juice instead of water. If your chicken breasts are larger (over 10 oz. or more), increase the cooking time by 3 minutes. To make the dish spicier, use some red pepper flakes. 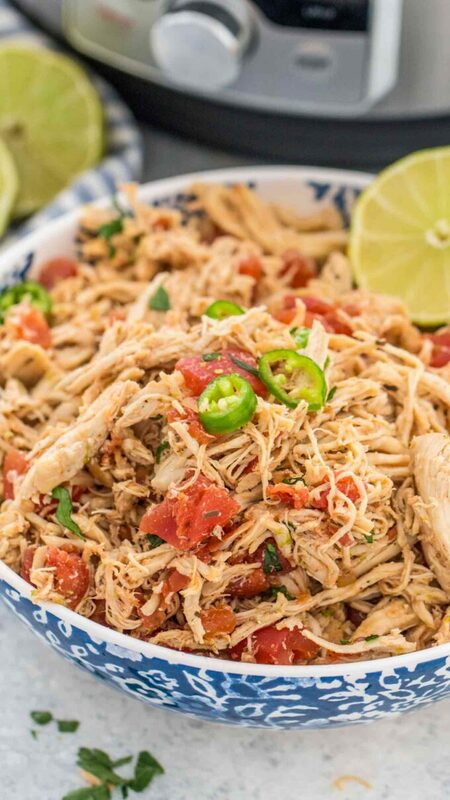 Instant Pot Salsa Chicken is a quick and easy recipe to make with just a few ingredients. With only 30 minutes of your time, you can have a perfectly healthy meal that can be used in tacos, burritos, over rice and salads. If using frozen chicken, before you add it to the Pressure Cooker, make sure its not stuck together. Add liquid of choice (broth, water, or juice) and the rest of the ingredients. Press manual and select 12-15 minutes for fresh/thawed chicken breasts, or 20-25 minutes, for frozen. It will take the pot about 10 minutes to come to pressure. Once the cooking is done and you hear a beep, leave additional 10-15 minute Natural Pressure Release. After, open the valve to release the remaining pressure. Fully cooked chicken breast should have internal temperature of 165 degrees F.
Enjoy over tacos, burritos, enchiladas, or salads.